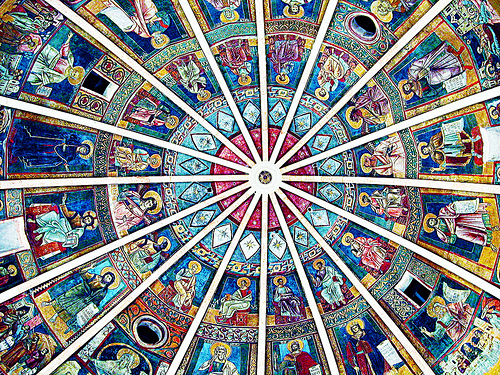 Emilia-Romagna is located in central Italy and borders Lombardia and Veneto to the north, Liguria and Piemonte to the west, and Toscana and Le Marche to the south. 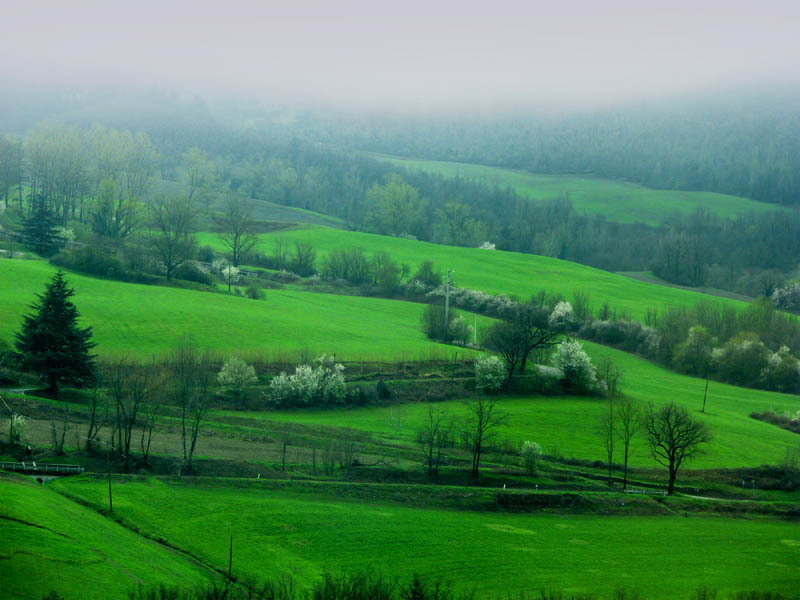 The landscape is varied with Emilia centred on the flat, fertile plains of the Po valley and its low hills, while Romagna is more mountainous (much of it is located on the northern slopes of the Apennines) and stretches as far as the Adriatic Sea. 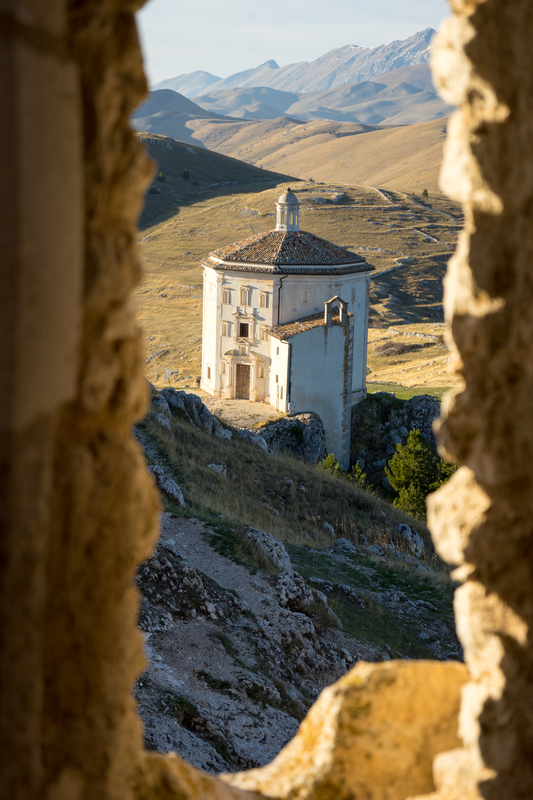 This affluent region is home to many food-related companies, including Barilla and Buitoni pasta, producers of Prosciutto di Parma DOP and Parmiggiano-Reggiano DOP (Parmesan cheese), wineries, as well as fashion, engineering, and white goods industries. 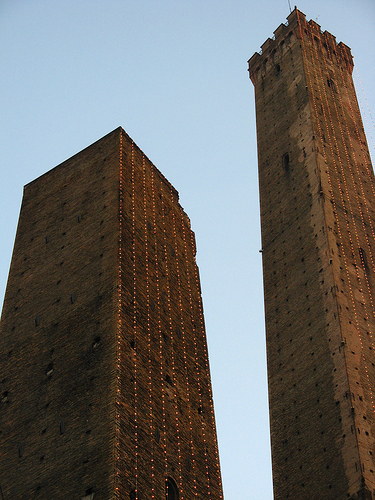 Bologna, the capital, is known as the “the red, the learned and the fat” (la rossa, la dotta e la grassa). ‘Red’ because of the colour of its beautiful brick buildings (and its political leanings), ‘learned’ for its university, one of Europe’s oldest, and ‘fat’ thanks to its exceptional gastronomic heritage. My first thought about the region is of its rich foods based on egg noodles, pork and cheese. These ingredients were historically reserved for special occasions such as weddings, celebrations, and feasts but now feature on all restaurant menus. 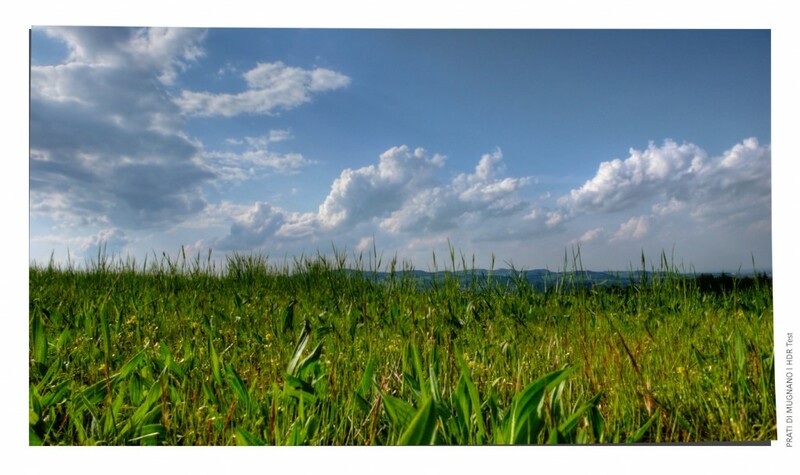 The region’s cuisine is rich in animal-proteins, useful for keeping warm in the cold winters. 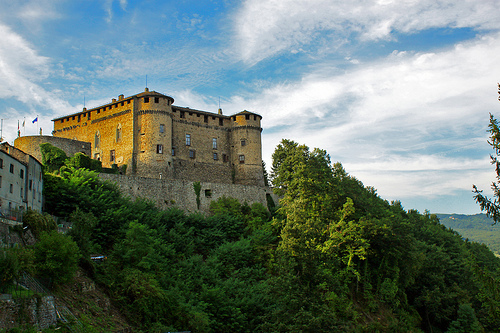 Emilia and Romagna are separate areas with traditions as distinct as their landscapes. They meet at the Via Emilia (the ancient road, built by the Romans in 187 BC, for which the region was named and historically used by armies, merchants, and religious pilgrims). 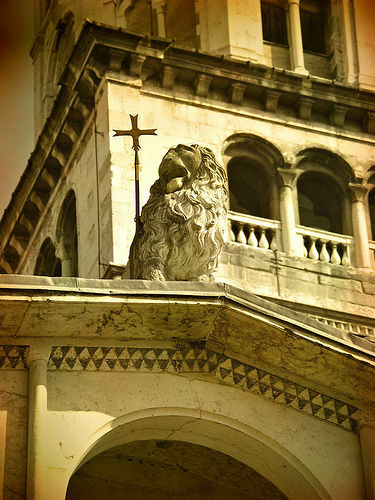 These travellers introduced foreign influences which spread along their route. 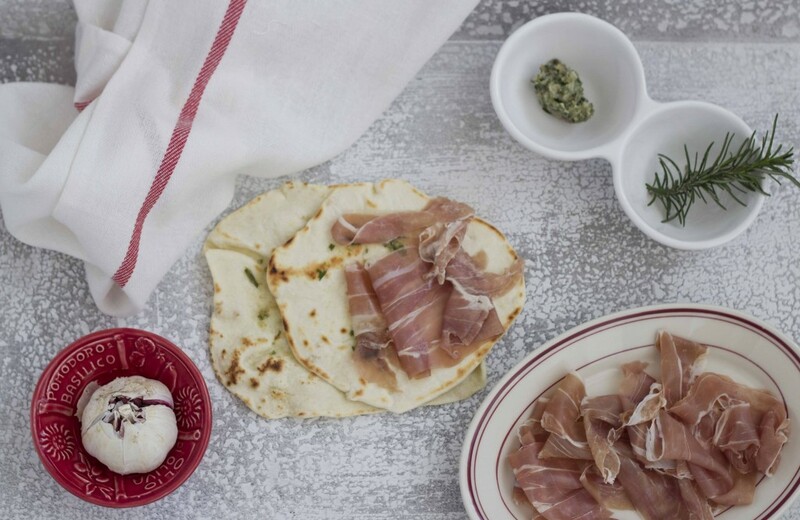 The people of Emilia-Romagna love the good table, ‘la buona tavola’. They are generous and open. 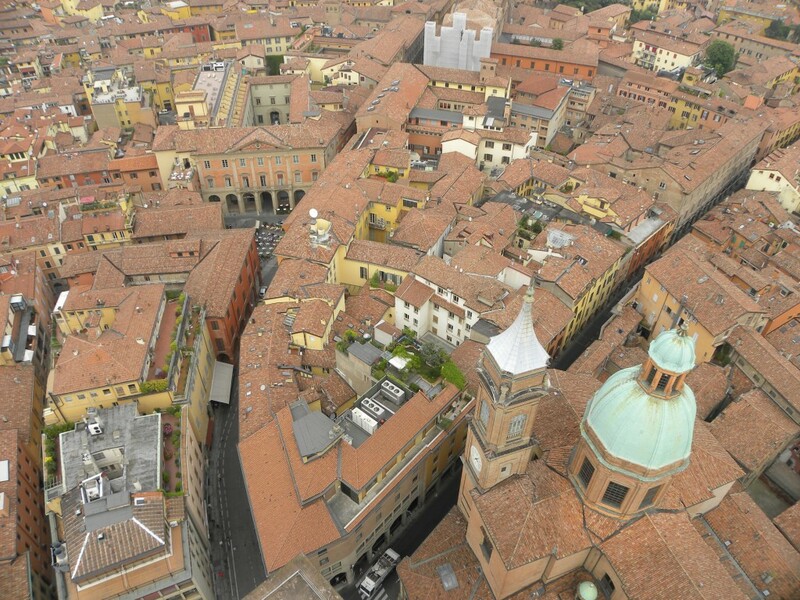 Bologna is a key city to visit and, more importantly, to eat in. 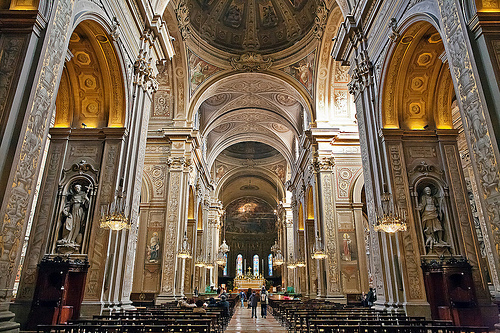 Don’t miss Piazza Maggiore, Piazza del Nettuno, the Due Torri (two leaning towers) in Piazza di Porta Ravegnana, the Basilica di San Petronio, the Basilicata di Santo Stefano, the Pinacoteca Nazionale (museum of art), and the Maesta in Santa Maria dei Servi. The narrow streets off Piazza Maggiore are full of temptation with food shops, bars and bakeries. 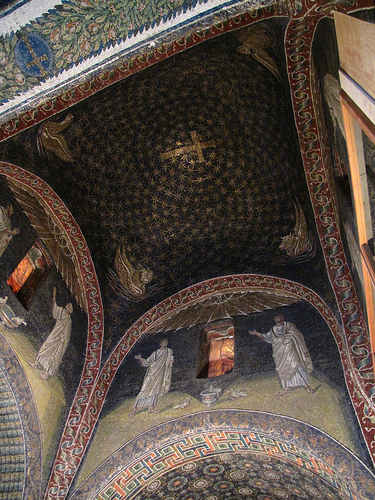 At the coast, Ravenna is an important town for Byzantine mosaics. 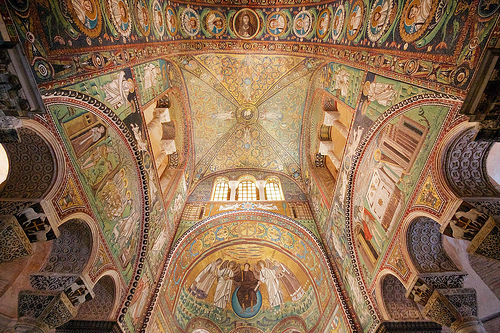 Don’t miss the Basilica di San Vitale, Mausoleo di Galla Placidia (the stunning tomb of the powerful daughter of a Roman emperor), the Basilica di Sant’Apollinare in Classe, and the Basilica di Sant’Apollinare Nuovo. 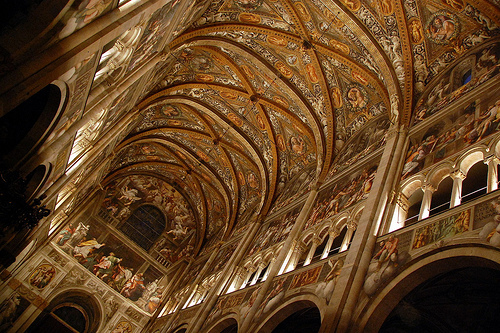 Ferrara, is a medieval town and important cultural centre during the Renaissance. 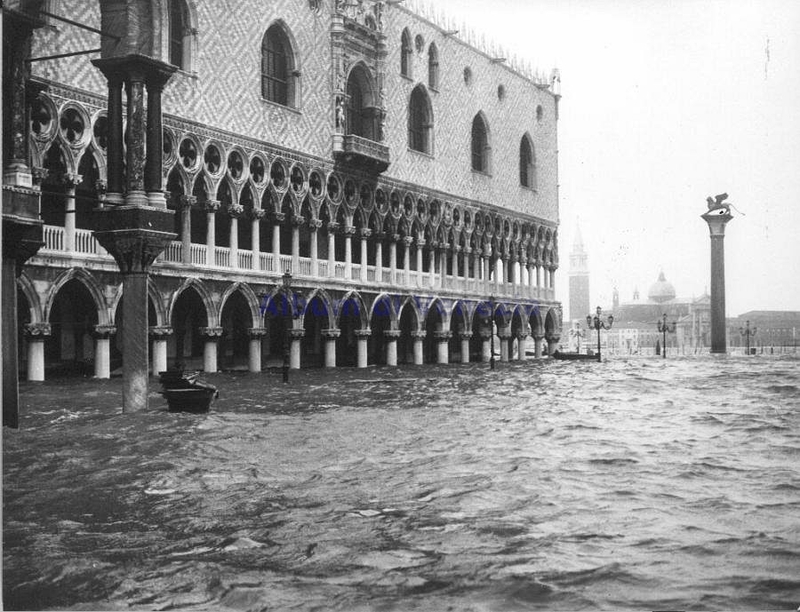 See the Duomo (cathedral), the Corso Ercole I d’Este (a street with many Renaissance palaces), the Palazzo Schifanoia, and the Rosetti works in the Palazzo dei Diamanti. 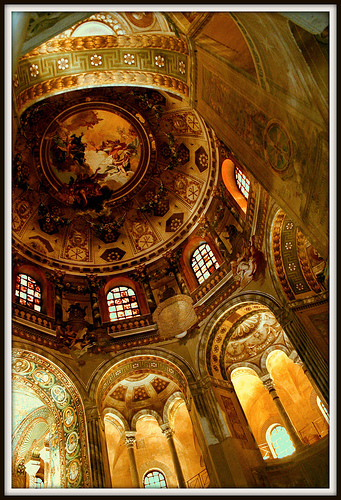 Parma is a thriving town with many cultural highlights, edible and non. 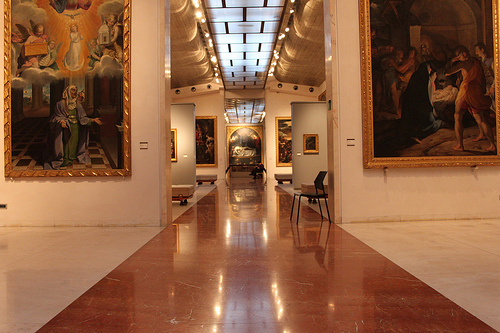 See the Duomo (cathedral), the Episcopal Centre, the Battistero (medieval monument), the Galleria Nazionale (art gallery), and the Castello di Torrechiara (a fortress). 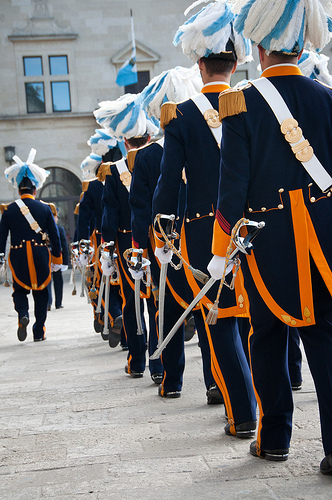 Go to the opera at Teatro Regio, long associated with the great composer, Giuseppe Verdi. 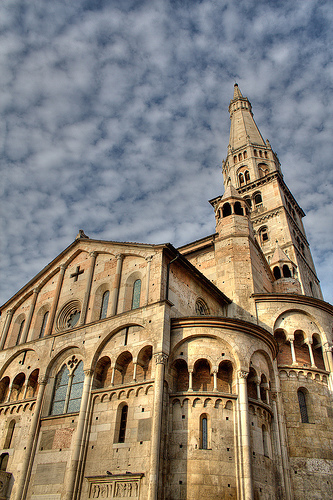 The Duomo in Modena is one of the best examples of Romanesque art in Europe. There are street markets in the narrow lanes of the city centre that boast many kinds of foods. 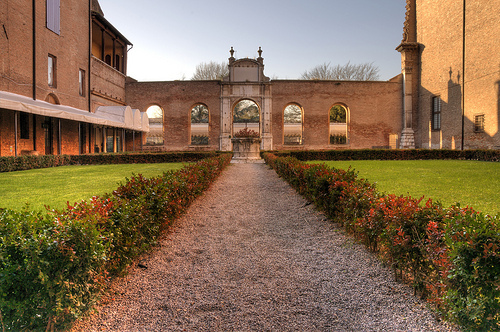 Near Modena, Maranello is where Ferrari cars are made and is home to the Scuderia Ferrari Formula One racing team. 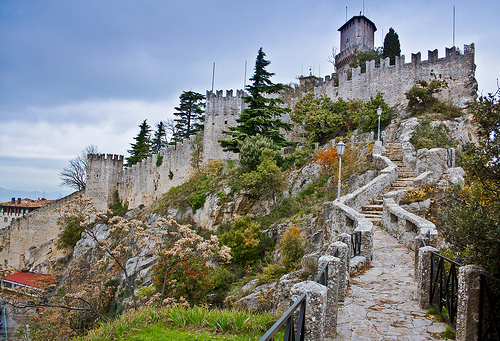 Visit the independent state of the Repubblica di San Marino (Republic of San Marino) and see the views from the Rocche (three peaks with three towers) and the village of San Leo and its fortress. 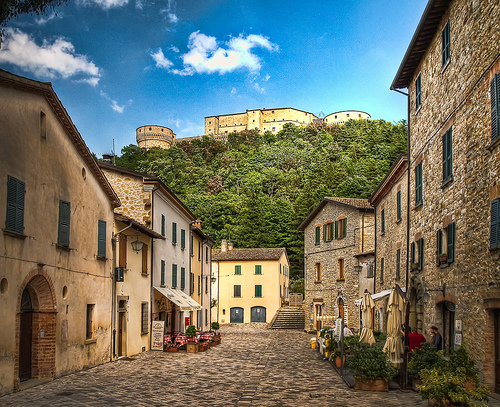 Other nice towns to see include: Brisighella (which has a walled fortress and produces olive oil, cave aged cheeses, and artichokes), Castell’Arquato (a beautiful medieval hillside town), Compiano (a medieval castle town which produces porcini mushrooms and chestnuts) and Vigoleno (an evocative castle town which produces passito style wines). 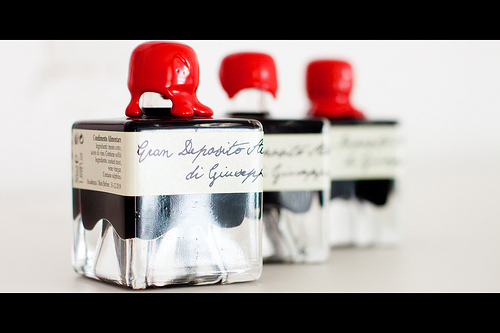 Bring home authentic traditional balsamic vinegar (aged from 12 to 100 years, and sold in very small and expensive bottles usually of 100 mls. The bottle should be numbered and should be marked Aceto Balsamico Tradizionale di Modena or di Reggio Emilia, from the Consorzio Produttori Aceto Balsamico Tradizionale di Modena or the Confraternita di Reggio), Parmigiano-Reggiano DOP cheese, Prosciutto di Parma DOP (Parma ham), Prosciutto di Langhirano (Langhirano ham), Culatello di Zibello DOP, hand-printed linen cloth from Romagna, and pottery from Faenza. 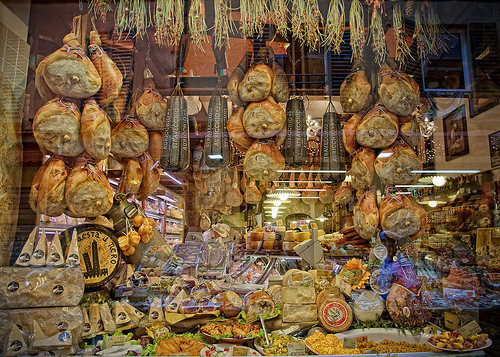 Emilia-Romagna is often referred to as the shopping cart of Italy in that some of the most famous Italian food products – the staples of Italian cuisine – are from this region: Parmesan cheese (Parmigiano-Reggiano DOP), Prosciutto di Parma DOP (Parma ham), and traditional balsamic vinegar all come from here. 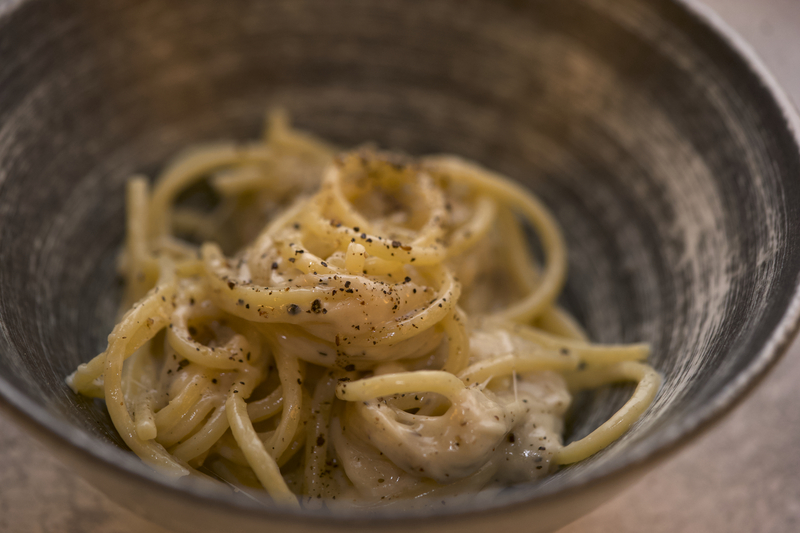 Emilia-Romagna is the home of silky, fresh egg-yolk laden pasta, laboriously rolled by hand on a matarello (metre-long rolling pin) or in a more convenient pasta-making machine. 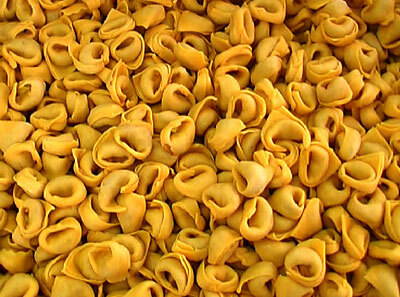 In the hands of a skilled nonna (grandmother), that yellow dough can be turned into hundreds of different pasta dishes. 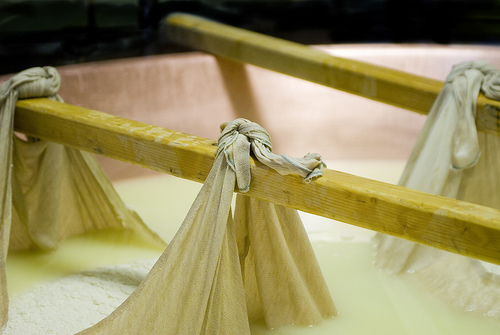 The pasta dough – of just flour and eggs – is kneaded before being rolled out flat into a large thin circle (la sfoglia). It then is either folded and sliced into noodles (like fettuccine or tagliatelle) or stuffed and shaped into small squares or circles to make ravioli or tortelli. The fillings vary from cheese to vegetables and meats. Freshly made egg pasta cooks incredibly quickly and is delicious served with meat or vegetable sauces or, in the case of tortellini, in meat broth. 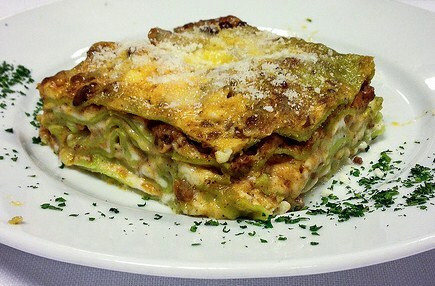 The sfoglia can also be cut into rectangles and used to make one of Emilia’s most famous dishes, lasagne, which layers the pasta with béchamel and meat or vegetable sauce. Each area of the region has its own specialty artisan food items. 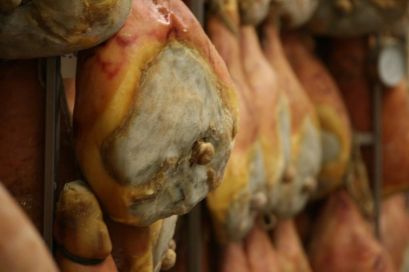 For example, Parma has its sweet ham, famous throughout the world. 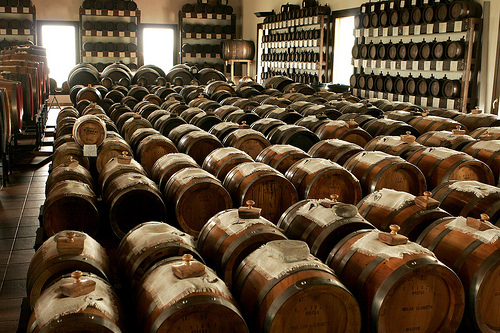 Piacenza is known for its hard bread and Modena for its balsamic vinegar. 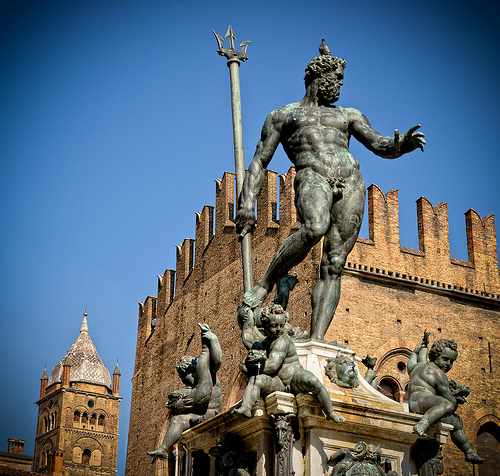 Ferrara is known for its spicy salami preserved for months in Marsala and red wine (salama da sugo Ferrarese). Comacchio, on the coast, is famous for its eels. 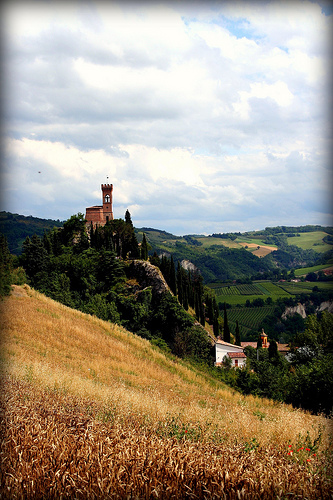 Romagna’s food is more inclined to rely on mountain food: roasted meats, wild mushrooms, and aromatic herbs. The bread of choice there is la piadina a flat, round bread made usually with suet that is cooked to order in a special pan and served hot. Other typical ingredients in the larder include polenta and dried pasta, as well as broad beans, chickpeas, and dried mushrooms. 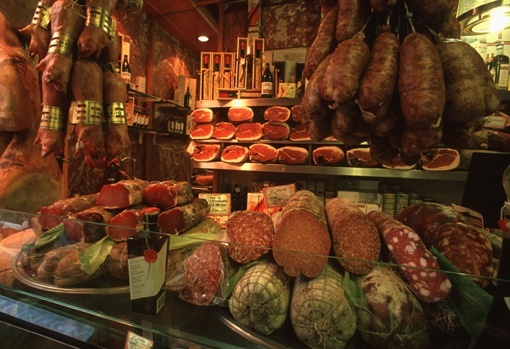 Pork products such as pancetta and cotiche (cooked pork skin) are popular as are many types of sausages and salami. In the coastal areas, all sorts of seafood is available, from fish to shellfish. 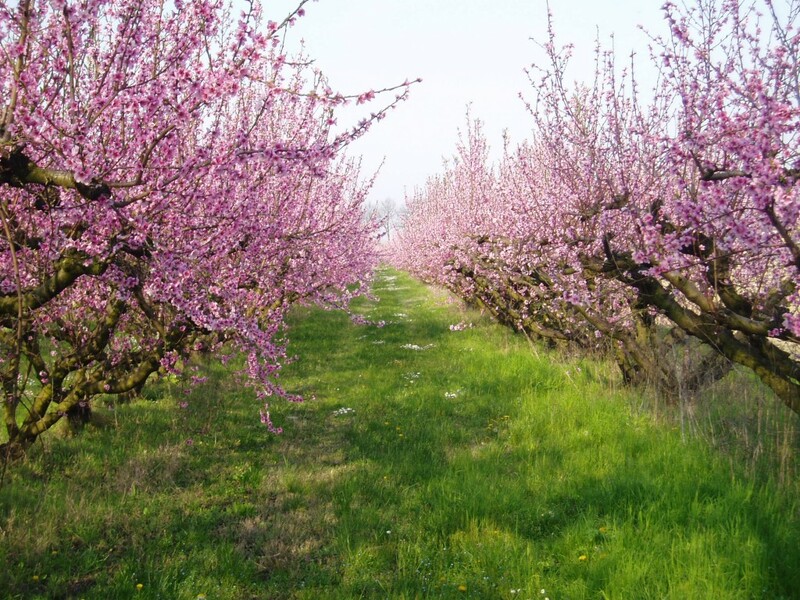 The region also produces vine and tree fruits such as grapes, mulberries, peaches, and cherries. The dishes from Emilia include Bologna’s signature dishes of tagliatelle alla bolognese (tagliatelle with meat sauce), and lasagne alla bolognese (plain or spinach pasta sheets layered with meat sauce, béchamel, and Parmigiano-Reggiano DOP cheese). 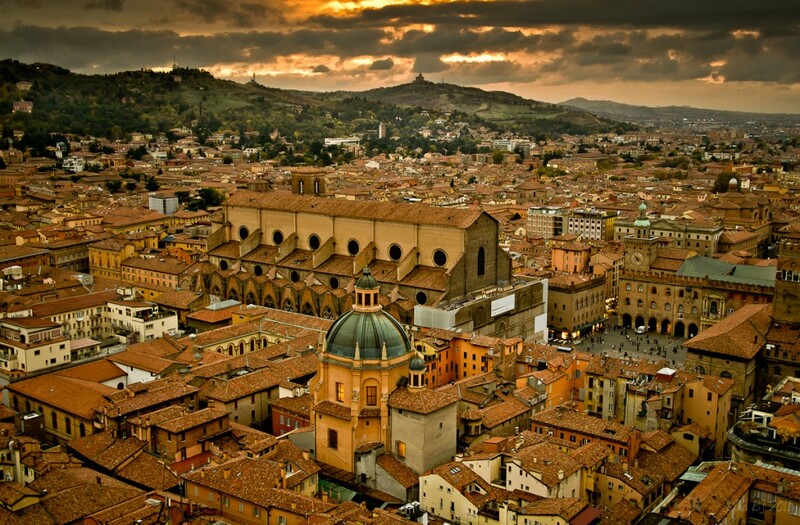 Piacenza is known for its tortelloni, Reggio Emilia for cappelletti (hat-shaped stuffed pastas), erbazzone (vegetable filled pie) and stracotto (beef pot roast), and Modena for its tortellini (stuffed pasta), zampone (stuffed pig’s trotter) and its desserts. 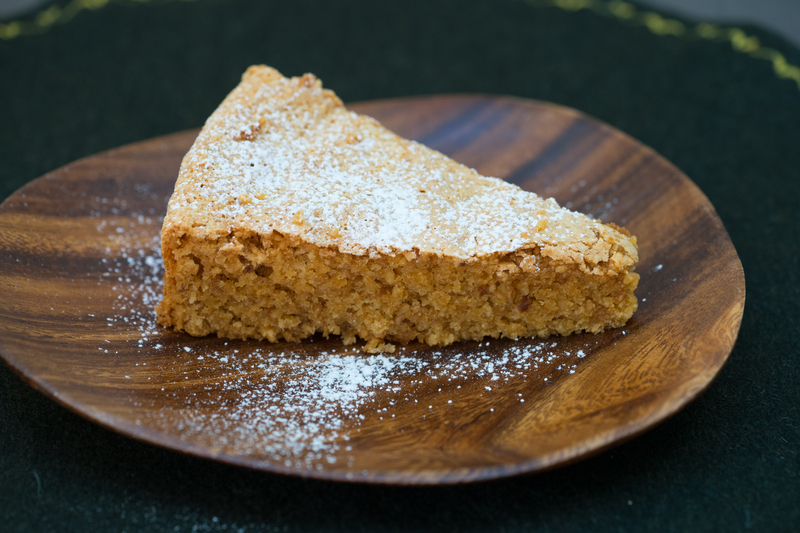 See recipes from Emilia-Romagna here. 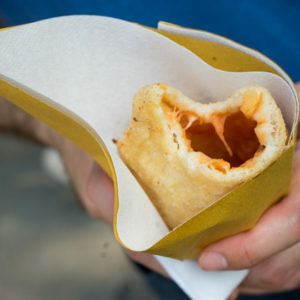 Romagna instead is famous for its piadina, at its best when grilled over a wood fire. Fish is well loved in Romagna and is enjoyed in fish soups similar in fashion to neighbouring Marche’s brodetto. Fish is also cooked skewered and grilled, gratinéed with oil, parsley, and garlic served with a tomato herb sauce, or boiled and served with lemon and olive oil. 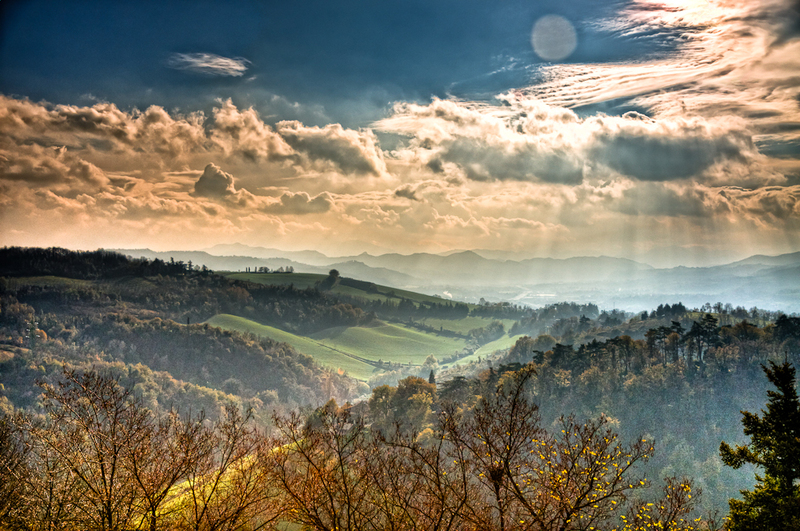 The region is also known for its wines, from the whites of Emilia’s hills to the sparkling Lambrusco of the plains, to the wonderful Sangiovese now being produced in the Romagnan hills. Lambrusco is a sparkling red wine enjoyed locally with fresh egg pasta or salumi. Good producers to look for is Paltrinieri (particularly Solco) and Medici. 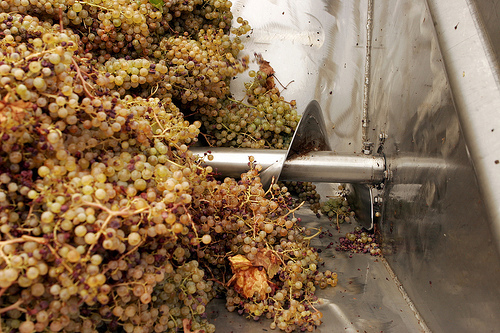 White wines from Albana di Romagna DOCG are enjoyable. 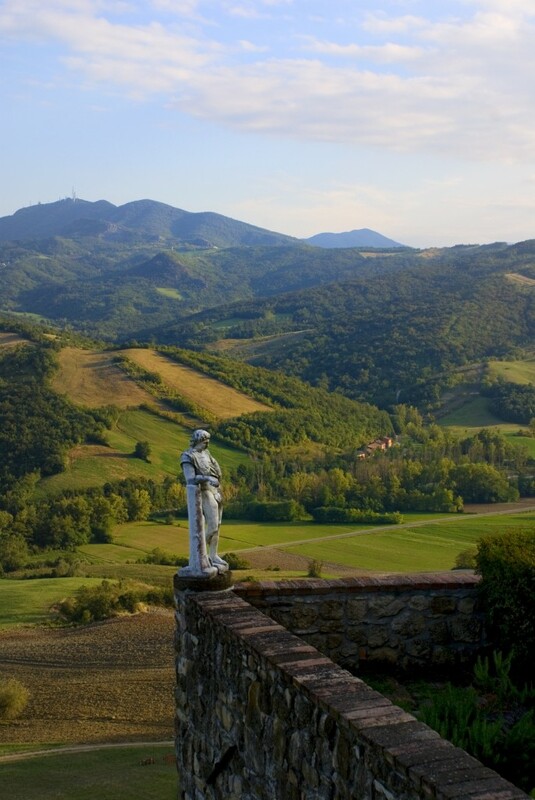 Look for white wine producers such as San Patrignano (particularly Aulente bianco), Tre Monti and Zerbina. Enjoyable red wines are produced in Colli Piacentini and Sangiovese di Romagna. 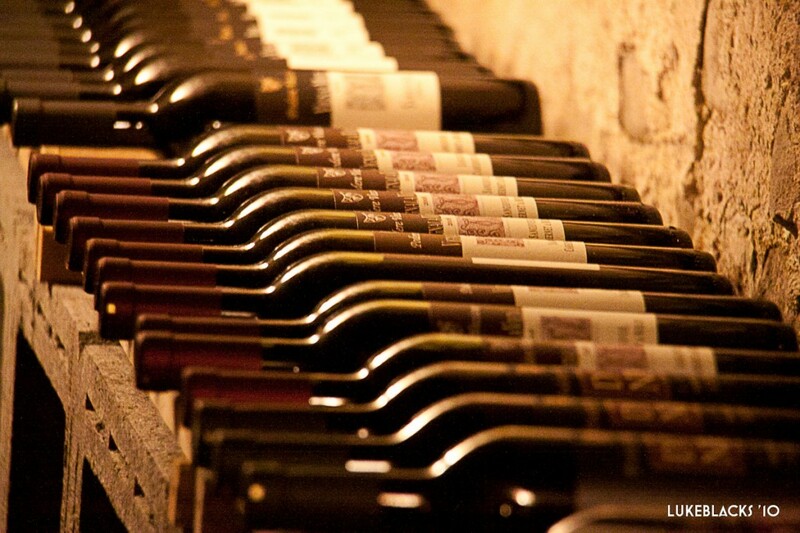 Producers to buy from include Drei Dona’, Calonga, San Patrignano, Tre Monti and Zerbina (particularly Pietramora). Another local drink to try is nocino, a liqueur made from walnuts. 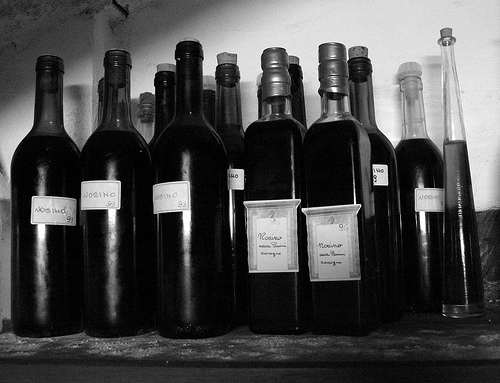 The passito-style sweet wines made from Albano di Romagna is a nice dessert wine to enjoy with biscuits or cake. Try Zerbina as a producer. 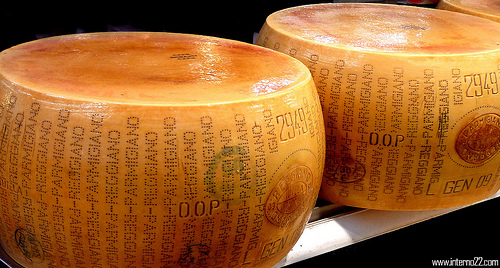 Parmigiano-Reggiano: Why you should avoid buying “Parmesan” cheese and what you should buy instead.